Located in North Topeka, Kansas, the Union Stock Yards Company was organized and incorporated in 1885 with the Chicago, Rock Island and Pacific Railway Company owning 131 or 310 shares of stock. 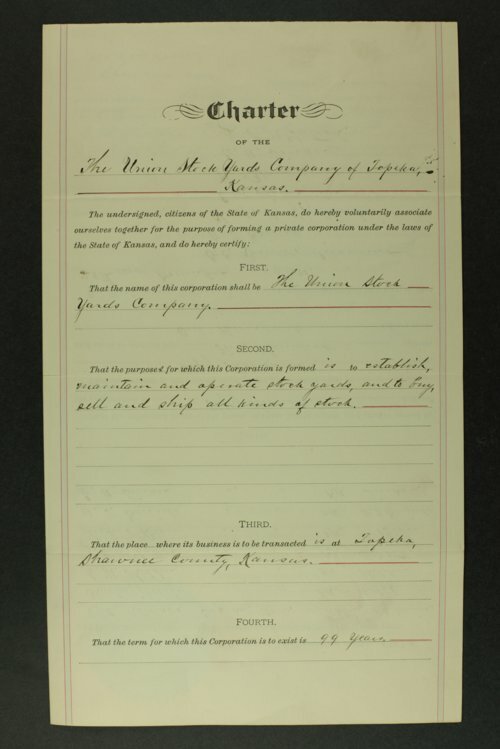 The company operated until 1898, at which time C. F. Jilson (trustee for the CRI&P) acquired the deed. The CRI&P operated the business at a loss from 1898 to 1900, when it failed. In 1904, the CRI&P bought the remaining stock holders interest and transferred the land to the Kansas Town and Land Company. These records include the company charter, land contracts, livestock reports, correspondence, financial statements, and meeting minutes.